Focused on accessibility and web standards. First let me explain what a QR code is. A QR code or Quick Response code is a barcode or 2D code that is designed to be read by smartphones. The code consists of black modules arranged in a square pattern on a white background. A new study release by comScore, Inc., a leader in measuring the digital world, found that in June 2011, 14 million mobile users in the U.S., or 6.2% of the total mobile audience, scanned a QR code on their mobile device. The largest population was male at 60.5%, ages 18-34 and had a household income of $100k or above. The study also analyzed the source and location of QR code scanning, most users scaned codes found in newspapers/magazines and on product packaging and do so while at home or in a store. How does your organization create QR Codes? Creating QR codes is cheap most of the time free. In fact, many QR code generators are free. CNET offers a compilation of QR Code generators or most URL shorting services, like bit.ly create QR codes as well. Has your organization tried out QR Codes? I’d love to know in what way. 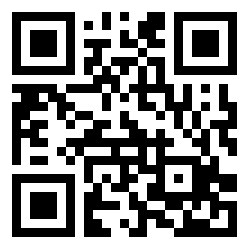 For more information read: QR Codes: How to Read Them by interlinkONE, Inc. Whether you want a visitor download an e-book, buy your product or register for an event, optimizing your landing page is essential your campaign. If visitors can’t quickly find what they need, they’ll leave your web site annoyed and possibly not return. Clear calls to action. Use buttons and/or links, to direct your visitors to they should do. Eliminate unneeded Elements. Minimize Distractions by eliminating navigation bars, other calls to actions, and links to other areas of your web site. Write in the second person. Use you and your instead of he, she, his, her, I, me and my. Use bullets or numbered lists for your most important points. Many visitors will scan through your copy. Make it easy for them to figure out the point of the page. Make sure your page loads quickly. The biggest single reason visitors do not stay at a website is that it takes too long to load; that is, the time it takes for the page to appear on the computer screen. Only ask for what you need. If you only need the visitors Name and Email address, just ask for that. The more fields in a form, the less likely a visitor is to fill it out. Spell Check. This should be a no brainier, but you’d be surprised how many web pages have spelling errors. Don’t Just Send Them to Your Home Page. Once a visitor completes your call to action send them to a specific Thank You page. 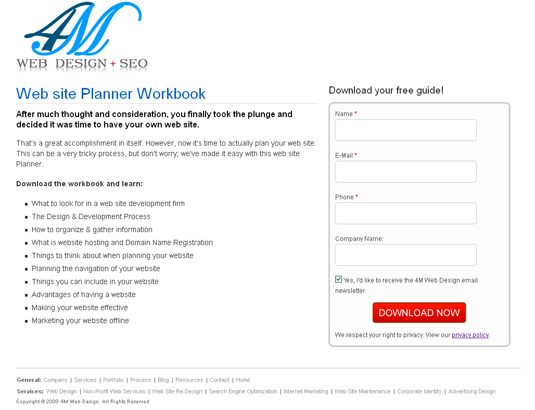 Take a look one of our landing pages for our “Web site Planner Workbook”. The +1 button makes it easy for visitors to recommend your pages to friends and contacts exactly when their advice is most useful — on Google search. 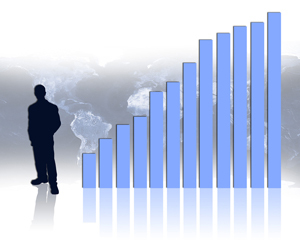 As a result, you could get more and better qualified site traffic. The new Twitter Follow Button is similar to how the Facebook “Like” button works on websites, enables users to start following your business’ Twitter account with a single click. Time to update your sites! Google just released Page Speed, a great tool for analyzing your website’s speed. It will show you where you rank (on 100-point scale) and generate suggestions to make that page faster. On Wednesday, Google released +1, a button, much like the Facebook Like button, that can be added to content pages. Users who click the +1 button are giving that content a direct recommendation to Google. +1 is currently being rolled out as an experiment and you need to “Join this Experiment” with Google to have access to it. In order to use +1 you will have to be logged in to your Google account. Once a your logged in simply click the +1 button next to a search engine result, Google will keep track of the +1 and highlight that search result if it appears for any of your friends. You’ve probably seen custom Fan Pages like those of Susan G. Komen for the Cure, the Make a Wish Foundation or the American Red Cross. 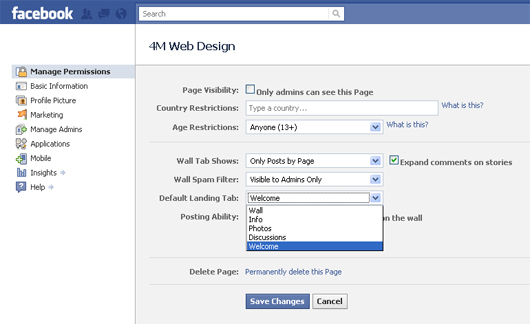 When you land there, you start on what is essentially a mini website within Facebook, instead of the Page’s wall or feed. These are often used to promote special events, an annual appeal or simply welcome visitors. Anyone with a Fan Page can create one, and it only takes a little effort. 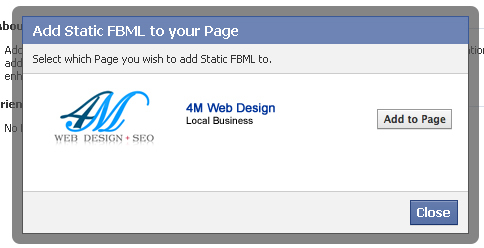 Step 1 – Download the Static FBML application from Facebook. 2. Go to the Static FBML application page on Facebook. 3. 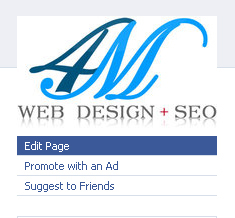 Click ‘Add to my Page’ on the top left hand corner under the logo. 4. A popup window will open up containing pages that you’re the admin for, Hit the ‘add to page’ button next to the page you want to use Static FBML on. 5. 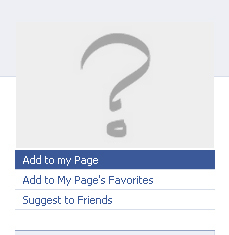 Go to the Facebook page that you selected and look for the ‘Edit page’ link under your logo and click it. 6. Click the ‘Applications link’ on the left. 7. Scroll down until you see the FBML, Click ‘Go to Application’. 8. 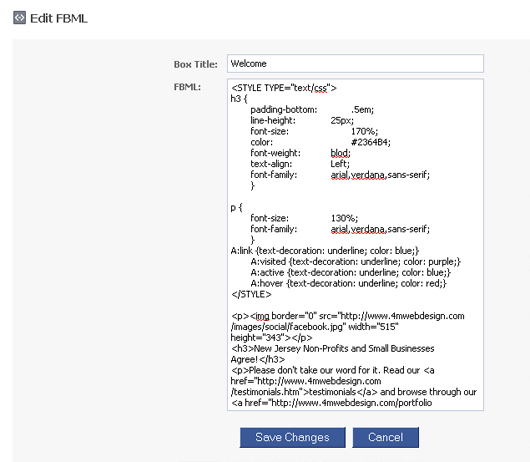 Change the Box Title and enter your html. “Box Title” will be the name of your tab, I used ‘Welcome’. The main text field is where your content goes, and you can add standard HTML to the page as you would any website, including images, text, links, and other formatting. Note: Your images must be hosted elsewhere (on your non-profit’s website, for example) and only referenced in your HTML code. 9. Once you’re done click ‘save changes’. 11. A popup box will appear that lets you choose where to display your new application. Hit ‘remove’ for the box and hit ‘add’ for the tab. Then hit ‘okay’. 12. Click the tab to check that it all looks ok. You might need to go back into edit the page to tweak it and get it looking right. Step 2 – Make your landing page automatically shown to new visitors. 1. To change this visit your page and again click the ‘Edit Page’ link under your logo. 3. Find ‘Default Landing Tab:’ click the drop down box and select your new tab. 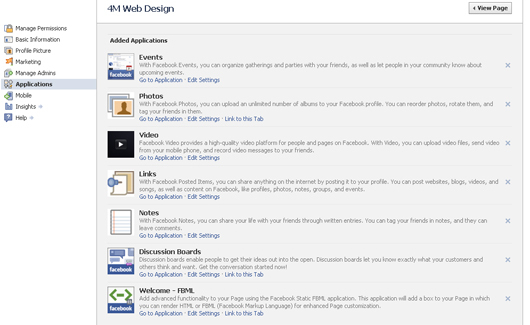 I’d love to see examples of your Facebook Landing Page’s. Feel free to link to your pages below by clicking the ‘link to this tab’ link in the FBML application. It’s easy in an economic downturn to not move forward with new projects, but building or re-designing a website is a cost effective solution to survive economic hard times. 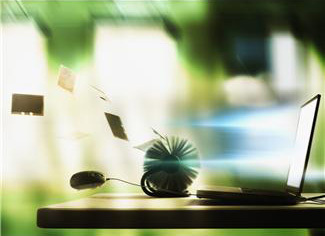 Timely Updates – Unlike traditional media you can update the information on your website any day anytime. You can also test content and adapt when needed. Measure Return on Investment – You can use traffic monitoring tools to get a clear understanding of the visitors to your website, and what they view. It’s expected! – 54% of consumers say a website had some influence over their ultimate decision to buy from a supplier or a product. 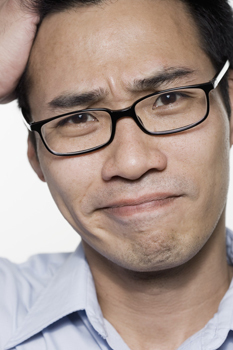 Reduce customer service costs – Do you answer the same questions 20 times a day? Your website can answer typical questions in detail via a frequently asked questions section, which will free up your staffs time. Save money on Postage – Rather than mailing forms and invoices you can offer them via your website. 24/7 – Your website is still working while you sleep. The need for Speed – Using blogs, email newsletters and social media affords you the opportunity of instant communication. Your competition – Why let them have an advantage? Everyone always asks how they can make their website more effective. Here are some key points that you should focus on in order to be more successful on the Internet and with your website. The single most important tip is to decide on what role of your website should play in your marketing program before you order it. Do you want to educate the market about your products? Provide a 24-hour information resource for current customers? Showcase your products? Generate requests for literature and leads? If you set objectives and stick to them, your website will be a success. Turning a website visitor into a customer is the most-overlooked aspect of web-based marketing, even on the biggest commercial sites. You want those who visit your website to buy. The easiest way to accomplish this is to engage them in a two way dialog, so you can market to them on your own terms. Get them to volunteer their name so that you can inform them of specials, product upgrades, events, and new products via e-mail or regular mail. How do you get them to volunteer their name? Offer them something! A free catalog, a free quote, a free analysis, a free reprint of an editorial article — anything your buyers might find of value. Other methods might include weekly drawings for free gifts (T-shirts, free product, etc. ), or other promotional giveaways. People are not patient. Studies have proven that people will read long ads and marketing materials, but only if it’s clear there’s “something in it” for them. Be concise. Be quick. Be interesting. Don’t beat around the bush with long introductions or unrelated information. Tell your customer what they want to know and they’ll stick around for more! Remember, your website should appeal to the interests of your audience, no one else matters! Focus on your target audience and put yourself in their shoes. If they’re interested in your product because it saves them time, then focus on convenience; don’t start your pitch with a laundry list of less-important features. Focus on the key benefits of your product and leave the details for later. Would you open a sales office in a distant city and then not tell your clients in the area that it had opened? Of course not. Think of your website as an automated sales or service office on the Internet and let your “universe” of potential buyers know that it’s available to them. Put your web address on your stationery, business cards, ads, brochures, and other sales materials, use a rubber stamp if necessary. Be creative! For example, send out an “birth” announcement on a postcard. You should also remember to keep your domain name easy to remember. There shouldn’t be any dashes or numbers if it isn’t necessary. The general rule of thumb is the name should either be the company name or something that will be so easy to remember that if you gave your business card to someone and they lost it, they should still be able to find the website. Make sure the information your prospects or customers want is available. For example, websites are ideal ways to disseminate the latest information about your product. You can include specifications, case studies, success stories, white papers, or testimonials. And don’t forget to include important contact information like your toll-free ordering line, customer service number, or how to get technical support. Make people want to come back to your website, make it “sticky”. It should be updated continuously, with events and news. Your site should also give them the incentive of coming back (e-mailed newsletter, product specials, contests, etc.). You’d think this was obvious, but it’s overlooked far too often. You absolutely must make it easy for a reader to express their interest in your website. Plaster your 1-800 number across it, make sure there’s a link to your e-mail system, and treat visitors with the care you show any other prospective buyer. I have seen sales-oriented websites that never once listed a phone number or a “click to send e-mail” button. When you compare the cost of establishing a website to what it costs to promote your business in print or on the air, you’ll see that a website is the cheapest form of marketing. A radio campaign featuring several 30-second spots per week for three months could run you $10,000 – $15,000. That gets you five minutes per week of exposure for three months in the local area only. Newspaper and magazine ads are similarly highly priced, and they only last for the life span of that particular publication. A website has virtually limitless space. You could put up a brochure website with dozens of photographs and several thousand words for under $5,000 for the first year, and keep it up and running for a few hundred dollars per year after that. What would it cost to run a newspaper ad of this size for a year? Imagine how much it would cost to produce a catalog for 200 different products, and keep it in consumers’ hands for an entire year. You can accomplish this with a website very easily, with low development cost and almost no distribution cost. Websites are in full color – a palette of 16.7 million colors for your photographs alone. A website is accessible worldwide. There are no physical limitations to broadcast areas as in radio and no circulation region restrictions as in newspapers or magazines. You can keep your website more current more affordably than any other media; you can update a website immediately, and as often as you like. Imagine you sell products whose prices fluctuate. With a website, you can change these prices every time they go up or down, so your marketing materials are always accurate. 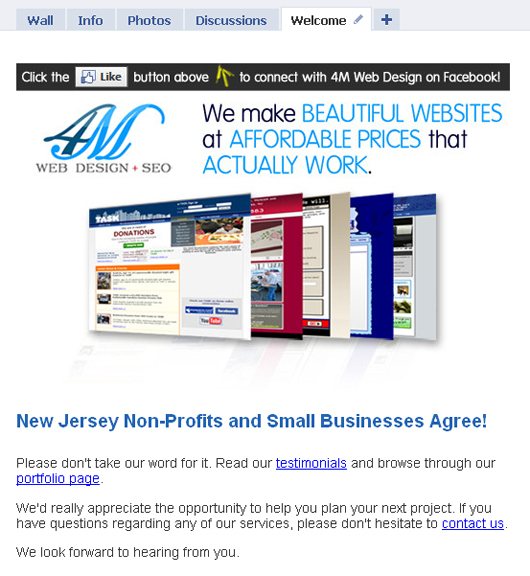 Websites are economical and not limited by size. This means a small business can present as large or creative of an image on the Internet as a bigger company – with the right design team. A website also allows easy and safe communication between the consumer and you so that anyone who visits your site can contact you at any time by sending an email. Unlike communications that originate from other forms of advertising, consumers who send emails don’t have to deal with many problems of everyday business: pushy salesmen, remembering to call during business hours, having to battle crowds to get to your stores, spending time waiting on voice mail or getting the wrong information. It’s convenient, easy, and safe for the consumer. Email is also convenient for you. What advantages would you like to gain from your web site? What disadvantages do you think you may encounter? How do you plan to overcome those disadvantages? Who is your primary target market? Who are the main customers you wish to reach? To whom do you sell or want to reach primarily? Other businesses or to the general public? How will your web site compare to the way your business / organization currently operates? Are you planning an online brochure to enhance your marketing or showcase your product / service? Would you like to receive orders and sell merchandise over the internet? Have you selected a domain name for your web site? Is it currently registered? Will your site need a security certificate? Will you be processing credit card transactions? How will you generate demand for your product or service? Will you offer banner ad space? Will you offer referrer bonuses? Will you offer contest-based promotions? Will you offer coupons for using the web site? Will you be participating in email marketing? On what other media will you be advertising your business? Will you be adding your web site information to that media? Who will be answering email generated by the web site? Will your customers have a phone number at which you can be reached on the web site? Which functional features should your web site offer? Which informational elements should your site contain?